Extra assistance for renters who are displaced through no-fault evictions failed to pass a second reading at the Oakland City Council last night after Councilmember Annie Campbell Washington had the legislation pulled from the agenda's consent portion of the calendar and scheduled for a future council meeting's non-consent portion, where it will likely be debated and amended. The tenant assistance bill, authored by Councilmember Rebecca Kaplan, would extend cash payments — between $6,500 and $9,875, depending on the size of the rental unit — to renters displaced through no-fault owner move-in evictions and condominium conversions. Renters with children, or those who are elderly, disabled, or low-income would be eligible for additional assistance. Currently, only tenants who are displaced through Ellis Act evictions and code compliance issues are eligible for relocation assistance. Kaplan's proposal would apply to all rental units in the city, including single-family homes. The proposal sailed through an October committee hearing, and while over a dozen tenants and advocates spoke in its favor, no landlords showed up in opposition. But on Monday, the Oakland-Berkeley Association of Realtors sent a letter to the council objecting to the ordinance, which the group described as "overly aggressive." The association asked that it be amended to require that tenants reside in a property for a minimum of three years before becoming eligible for relocation payments. Campbell Washington said in an interview that it isn't her intention to delay the relocation assistance bill, which she thinks includes important changes to the city's rental laws. She said, however, that the council should fully consider all the consequences of the relocation payments. Some small landlords might have trouble making the payments, and could therefore choose to not rent out homes. "My intention is to bring a reasonable amendment forward when we hear it at the next meeting on Dec. 12," said Campbell Washington, adding that she'd like to see the relocation payments increase by steps depending on the length of time a renter has lived in a unit. "I do think there are compelling arguments there that we need to think about as policymakers," she said about the realtors association letter. But Campbell Washington's move angered tenants activists. James Vann of the Oakland Tenants Union called the councilmember a "snake" for having the item rescheduled at the last minute. "Why are you doing this?" Vann asked during the council meeting. "Get out of the way!" Vann said the rescheduling meant that the new assistance wouldn't become law until January, or later, because an amended ordinance will require two readings at separate council meetings. He and other tenant advocates worry that between now and then many more renters could be displaced without financial assistance that could help them stay in Oakland. "It's just devastating that some members of the council would, after tenants testified multiple times, postpone passing a desperately needed tenant protection after one letter from the wealthiest lobby in California," said Leah Simon-Weisberg, an attorney with Centro Legal de la Raza who represents low-income clients. However, renter advocates cheered a separate new law that the council passed last night. 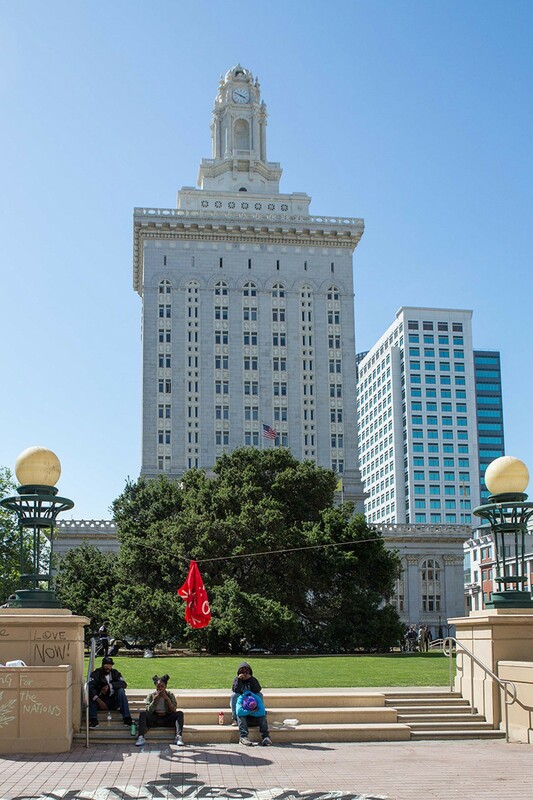 In response to complaints from tenants that landlords are using a provision of Oakland's rental housing laws known as substantial rehabilitation to improperly exempt buildings from rent control, the council implemented a 180 day moratorium on new petitions seeking to take advantage of the rule. For a full explanation of the substantial rehabilitation law, and why tenants object to it, see our previous coverage. Councilmember Dan Kalb, one of the authors of the moratorium, said he intends to work toward a permanent revision between now and when the moratorium expires. "While I'm disappointed that it doesn't cover the pending hearings, going forward it does at least stop the loss of needed housing that Oaklanders can afford," said Simon-Weisberg, who is currently representing multiple tenants who are objecting to petitions filed by landlords seeking exemption from rent control through the substantial rehabilitation rule.